Microsoft’s iPod competitor, Zune, has been revived with the newly announced Zune HD. But in spite of positive reviews, the overall response from consumers seems to be… well, lukewarm to say the least. 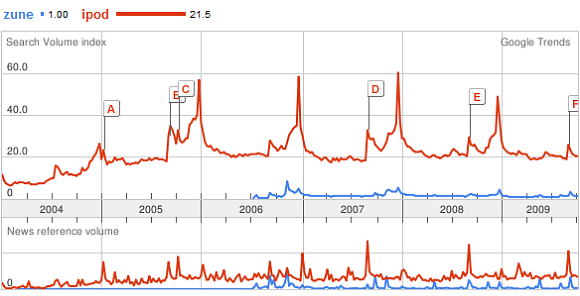 To give you an idea, let’s look at the search volume (via Google Trends) to measure interest for Zune compared to the market-leading iPod over time. Spikes around the Christmas holiday clearly show when these devices are most in demand, but what the above graph shows above all else is the general lack of success for the Zune, at least in closing the gap to Apple’s iPod monster. Still, Zune HD is a new contender, so this is just a historical overview. As you can see, there is a small increase in interest this September when the Zune HD launched, but then it goes back to normal. What if we look at just the last 30 days? 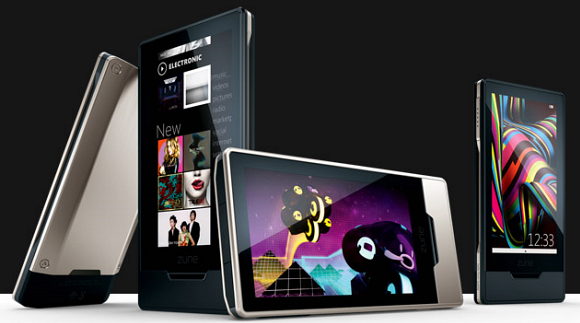 We should see SOME form of activity, people should be flocking to find out more about the new Zune HD, right? Keep in mind that Microsoft has just had a major media push for Zune HD. And interest is still flatlining. 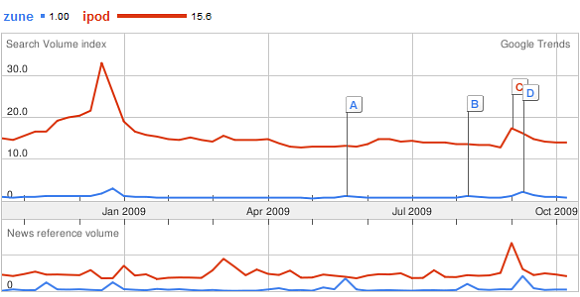 Compare that with the iPod, where interest rises every weekend (many shopping-related searches, perhaps?). This is all the more sad considering that the Zune HD has actually received some pretty good reviews and seems to be a really good device. We’ll see what the Christmas shopping season brings, when sales of these kinds of devices tend to boom, but it doesn’t look good for Microsoft’s “revival” of its ailing Zune series. What is Microsoft doing wrong with Zune? I own a Zune device. Totally adore but can’t really say what’s wrong with it, as in why there is a lukewarm response amongst the masses. Maybe Zune will pick up in sales once it goes international. Currently its available only in the USoA. I don’t think you’ve used the most objective tools to call Zune a failure. The Google trends are for international results, but Zune is only available in US and Canada (the Zune HD is only available in the US). So already, the numbers are a bit skewed, no? Look at the US only data, and the numbers aren’t quite that dramatic. 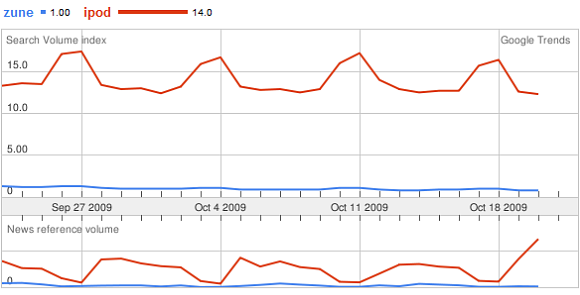 But still, using Google trends doesn’t show the whole picture. And iPod’s dominance is to be expected, don’t you think? So does this mean the Zune is in trouble? I find that a hard argument. @ACE: Even if you filter results to show only US, ok, the difference is less, but still huge. However, that was not really the point. The point was Zune’s curve, not iPod’s (which was put there to have something to compare with). It still pretty much “flatlines” if you look at the last 30 days, which does reveal that MS hasn’t managed to drum up enough interest for the Zune HD, which is what we were trying to point out here. Sure, the charts and trends are cool and all and show what is obvious, but to call a device “in trouble” when they were “in trouble” before they even thought about starting up is not fair. Yes, I run a Zune website and have some bias, but I also own more iPods and iPhones that most that worship the mighty steve has.